We are excited to have teamed up with Magic Meeple Games to bring Darkrock Ventures to Tabletop Simulator as official DLC, which was released on Steam on October 25, 2016. 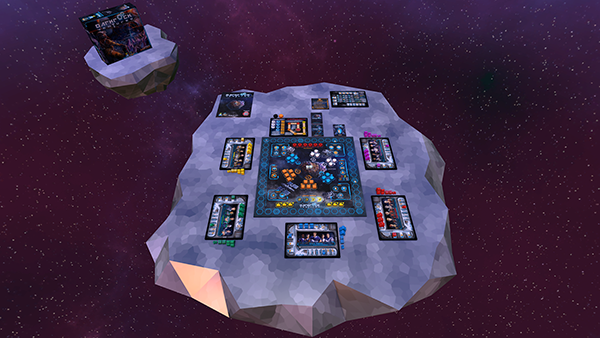 Darkrock Ventures is a worker placement board game about deep-space asteroid mining. Each player takes control of their own Asteroid Mining operation with little more than a ship and a skeleton crew. Corporate Sponsors are assigned to give each player some resources or credits to start the game with and then it is a race to extract as much wealth from the Asteroid as you can before the game ends when the Asteroid is nearly depleted. However, danger awaits! A vicious alien threat known as the Therion Marauders lurks in the shadows, waiting for ideal opportunities to delay you with targeted strikes on the Asteroid or surrounding Satellites. Prepared Miners can spend resources to power the shields and protect their crew, lest they are forced to flee and waste their action for the turn. The Darkrock Ventures DLC for Tabletop Simulator features glorious artwork by Naomi Robinson, all the components of the retail version of Darkrock Ventures, as well as the contents of Darkrock Ventures Expanson Pack #1, which includes 10 additional cards! Darkrock Ventures was designed by Michael Eskue, and co-published by Gamelyn Games, and Magic Meeple Games. Everyone must own Tabletop Simulator in order to play Darkrock Ventures.